I grew up on the South East coast of Ireland before moving to a rural smallholding on the Welsh marches. After studying media production for a few years I moved to veterinary nursing,. I worked in my local practice for three years before deciding I probably should get a job without the possibility of taking home countless strays. So, I moved to banking (where they are less keen on you taking things home with you! ), financial/investment services and, most recently, electrical and engineering purchasing. After gaining my qualification, I started working as a freelance proofreader, which also gave me the opportunity to finally finish and publish the first book of the Nomad Series, Ares; a concept that had been written and re-written (and re-written again) for more than 20 years, evolving, and developing with each year. So far, I am concentrating on my space opera Nomad series, but I have other ideas and stories flying around in my head. Watch this space! My passion for writing integrates with a busy family life, freelance proofreading, and trying to control a dog, a cat and a flock of strong willed sheep. Any free time is spent reading Stephen Leather, Andy McNab, J.R. Ward, Lee Child, James Rollins, and J.D. Robb. 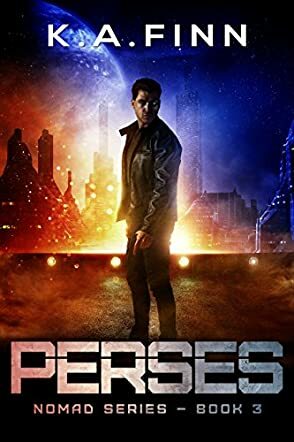 Perses is the third installment in the Nomad series by K.A. Finn, and is a sci-fi story set in Earth's distant future, where an evil government called The Foundation rules. In a bid to extend their rule to other sectors, they embark on a secret cyborg program. Bray and Garvan must find a way to escape The Foundation headquarters and survive long enough to travel back to the Outer sector. Bray hasn’t been on Earth for years and his family believes him to be dead. When he shows up on their doorstep, bloodied and desperate with another fugitive in tow, it’s a less than ideal homecoming. Will his uncle and cousin embrace him as he is now, or will they give him up to a fate worse than death? I haven’t read the other two books in this series, but Perses was easy to follow. It can easily be read as a standalone as the story mainly focuses on Bray and Garvan’s time on Earth. I liked this story’s family-oriented theme. As a sub-plot, it really added depth to the entirety of the book. To top it off, the story has some really cool fighting scenes that will blow you away. I wish I could jump right into the next book. K.A. Finn is a truly talented storyteller and doesn’t give Bray and Garvan an easy victory. The cost of escape is very high and I’m curious to see where this story is headed. Overall, I really enjoyed this book. Sci-fi and established series fans will not be disappointed by this latest addition.